Combining our innovative technology with reflexology, iSole can enhance sports performance and reduce fatigue with every step. The metatarsal and heel pads generate a PVA Field that stimulates the acupoints in the feet to improve body microcirculation, balance, and endurance. This ergonomically shaped insole ensures heel stability and arch support. Various metabolic and biological functions are improved as a result of the PVA Field, carried out by the metatarsal and heel pads of iSole. You will experience the incredible improvement of what iSole brings along noticeably, including better microcirculation, improve body balance (especially useful for the elderly), and the ability to overcome fatigue. iSole helps you to handle the sports and other energy-intensive activities far more easily. By gaining more stamina and endurance in most sports, your true potential will be unleashed and you simply will perform much better in training and sports performance. While preventing the chance of sustaining injuries, the exercise recovery period will also be significantly reduced. iSole is ideally suited for sports and high-impact activities. It can also be worn throughout the day at work or while engaged in daily routines. iSole comes in 4 sizes (XL, L, M, S) to suite for various footwear styles. 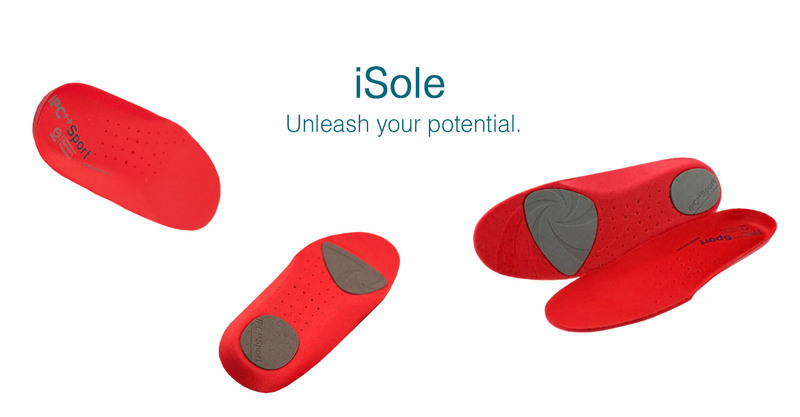 iSole is built with lightweight, highly breathable anti-bacterial foam. Its perforated design allows the best air circulation during use. The material can also be easily trimmed to fit into all types of shoes. iSole is enpowered by Pico Technology.